An all-new Subaru Impreza might have you thinking of Colin McRae, bright blue paint and gold wheels – but that’s not really the message Subaru wants to convey anymore. 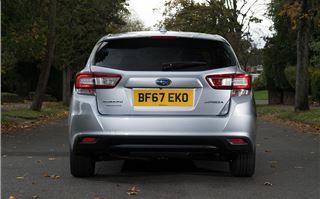 Instead, it wants you to think dependable, capable and family cars – and that is exactly what it delivers, albeit at a high price and without much in the way of flair. Nothing except the air conditioning controls is carried over from the old car, so it really is all-new and it feels it from behind the wheel. 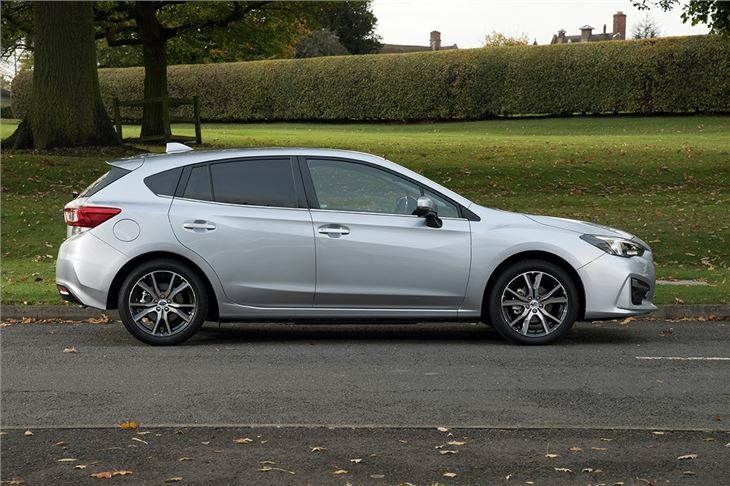 The material quality, fit and finish is as good as you’d get in anything from Honda or Toyota – and that’s a big step forward versus the old, drab, scratchy Impreza. In fact, it feels quite pleasant – which isn’t something you could say about Subaru models of the past. It’s practical too. 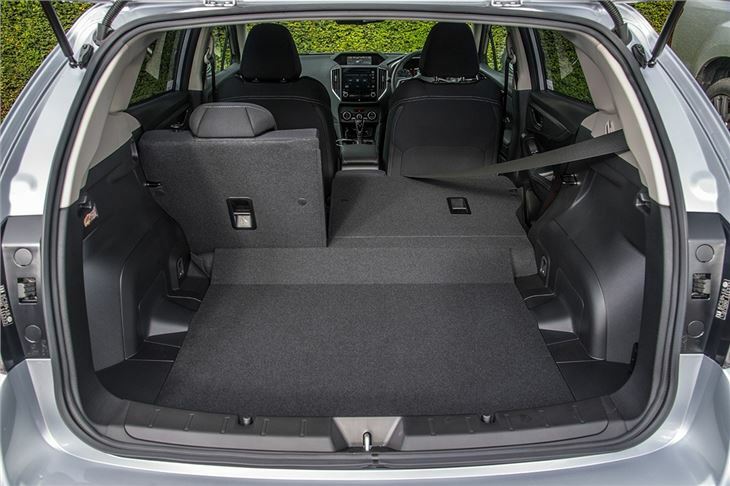 The back row of seats is spacious enough for adults and, if you have kids, the wide-opening rear doors will make getting them in and out very easy. 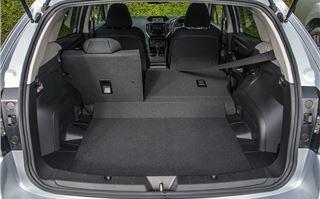 The boot is a good size and shape, with a flat, square load area and no lip, so you’ll get awkward push chairs or heavy, bulky stuff in and out without trouble. Capacity is 385 litres. 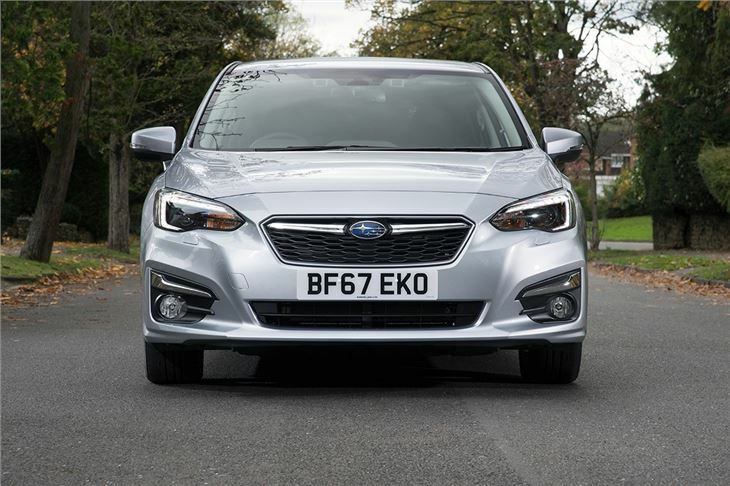 As important to family buyers as practicality is safety – and this is another area where Subaru has strived to make the Impreza competitive. In Japanese NCAP testing, it’s the highest scoring car ever thanks to its EyeSight active safety systems and strong construction. 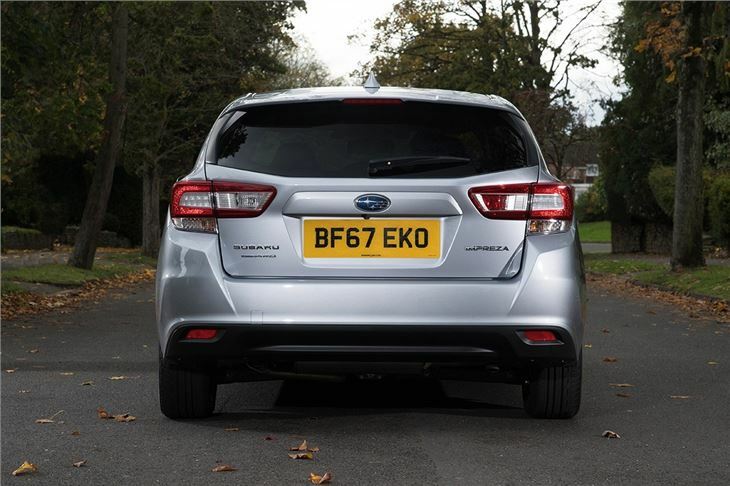 EyeSight includes lane keep assist and auto emergency braking and adaptive cruise control – and is standard on all cars sold here in the UK. 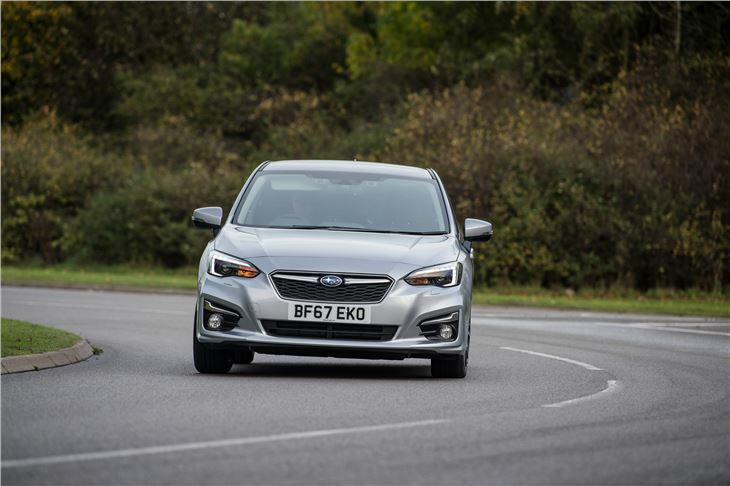 According to Subaru, the Impreza only supports the full range of EyeSight technology when paired to an automatic transmission – so a CVT gearbox is also standard in the UK. 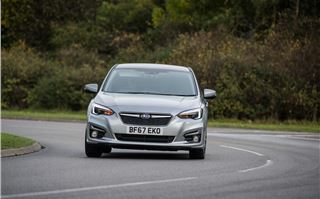 For a lot of critics, the CVT spells doom for the Impreza, since it’s not the right kind of gearbox for a driving enthusiast – but don’t be put off. It really isn’t as bad as you might be led to believe. In fact, if you aren’t heavy with your right foot, it’s about the most relaxing sort of transmission available in any car. It’s smooth and, unless you need to overtake or get onto the motorway in a hurry, mostly very quiet. That said, when you do put your foot down it makes a real racket, regardless of the engine you choose. And it’s the engines that are the weak point of the new Impreza. There are two options, both petrol. The entry-level choice is a 1.6-litre with 114PS, or there’s a 2.0-litre with a more substantial 156PS. 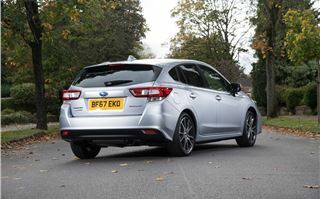 Both are flat-four boxer engines – as is the norm for Subaru – but neither is turbocharged, meaning they have to be pushed quite hard to make fast progress. It’s a shame, because a turbocharger, fitted to either, would make the Impreza much more compelling. If you still want the Impreza despite the lack of diesel or a turbocharging, then it’s the bigger engine you want. It delivers much more useable performance and punch with less of coarse whining its smaller counterpart makes, yet with no real impact on economy. 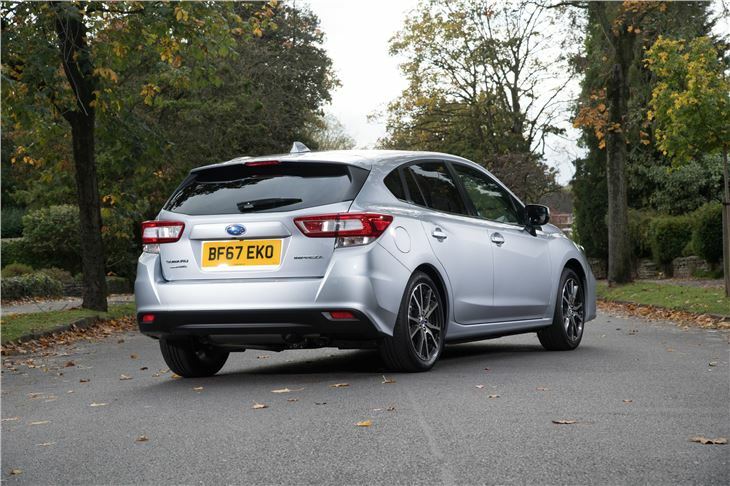 42.8mpg figure is hardly worth celebrating, but this is an all-wheel drive, petrol-powered car and Subaru does well in Real MPG, so it’s not all bad news. And while the engines are a bit lacklustre, the rest of the driving experience is very good. The steering is immediate and precise, there’s plenty of predictable grip and there is very little body roll through bends – and yet ride quality is very good. All-wheel drive means that level of confidence and predictability should be maintained even if the weather takes a turn for the worse, too. But there is a price to pay for that dependability. 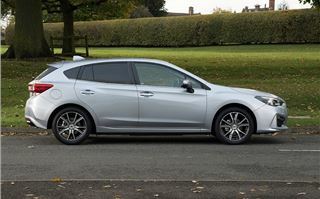 At £23,995 for the 1.6i and £24,995 for the 2.0i, the Impreza is far from cheap. Admittedly it’s fairly well-equipped, getting a touchscreen, Apple CarPlay, Android Auto, EyeSight active safety, LED lights and heated seats as standard in the single, SE trim level - the only thing we'd like to see is leather but it isn't even optional. Even with that level of equipment, it’s unlikely to coax buyers away from the Volkswagen Golf or Ford Focus, unless they really need an automatic transmission and all-wheel drive. 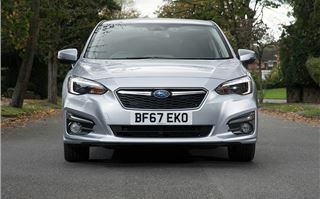 And that’s a shame really, because fundamentally the latest Impreza is very good. Through corners it’s excellent, plus it’s genuinely safe and very family-friendly. 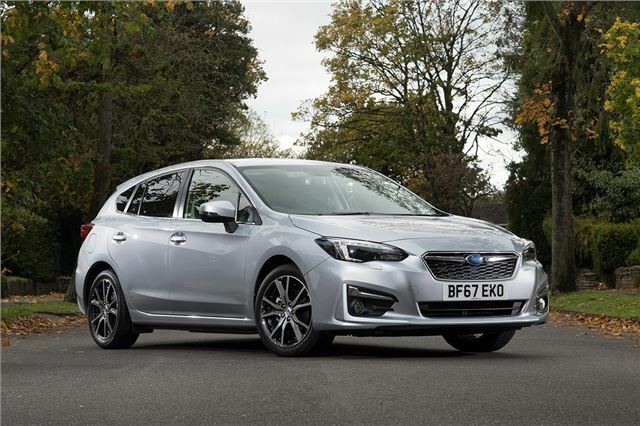 However, with no diesel, no manual transmission option and no affordable, base-specification version, the 2018 Impreza is probably not going to bring Subaru the mainstream appeal it so desperately needs in the UK. That's not to say it's a bad car - because it isn't - but we imagine it will continue to be bought by rural folk who trust the brand, trust the cars and genuinely need the all-weather capability afforded by the impressive all-wheel drive system. And if you’re one of those, you’ll like the new Impreza as much as ever.